I don’t know why we would ever need this, but someone thinks we do. You can invest in the production of a new accessory that turns your Smartphone into a spoon or fork. “For over 12,000 years, humankind has strived to create the perfect civilization. We invented agriculture. We invented the wheel. We created a system of laws. We sent people to space. Now, a new chapter in our history has begun. If you aren’t coordinated, or can’t do two things at once, maybe this device is for you. Do you lack the skills to eat with one hand and scroll through your phone with the other? Let me introduce you to the sphoon_phork. 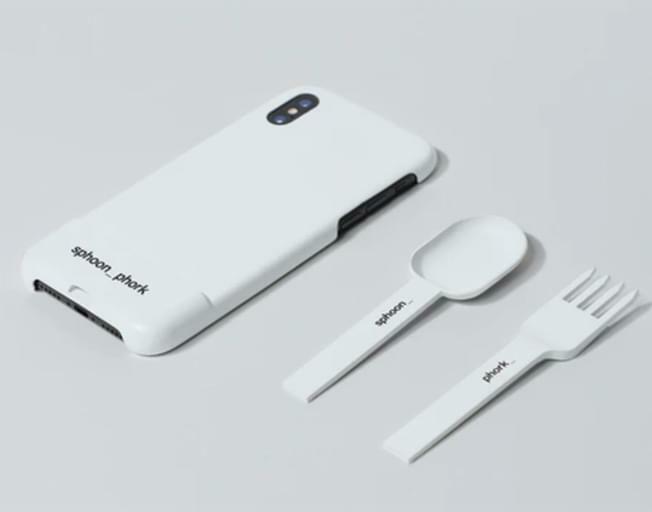 A phone case that comes with reusable spoon and fork attachments, so you can chow down on your noms, while watching those adorable puppy videos. At the moment, the Sphoon and Phork case only works with iPhone 7, 8, X and XS. So if you have another model, bad luck. Looks like you’ll be eating and scrolling the normal way. So far, it’s only raised about $178 towards it’s $11,000 goal, so I don’t think we have to worry about this “invention” too much. Be honest, would you get this for someone?